A friend, Boyd, has made himself a control desk that uses the push button approach to set tracks for trains to enter and leave his Swiss stations. The control desk is a set of push buttons which are connected to sensor inputs, allowing software to do all the grunt work of allocating and interlocking routes. I looked up how such control desks look in Europe and settled on emulating the Sp Dr L 60 desk as used in Germany for many decades, as much as is possible and practical. I changed the old style check boxes into controls that use the appropriate background colors. Turnout positions are shown in yellow. In the image above, the thick black lines represent trains. One route (indicated in white) has been set from the track he calls 33 Ost 4 to 24 MGB helix. The route was set by pressing the button on the desk at track 33 and while holding that, pressing the button at track 24. Since the track route was clear, all the turnout commands were sent out and the track marked as reserved for the train to depart. I generate the matrix of squares that are used for the desk each time the software loads so that they simulate the different levels of fading and wear as seen in the prototype. Buttons and counters can be aligned with the grid of tiles that make up the desk. The trains on Boyd's layout are run manually by humans and he expects the operators to set the signals appropriately before driving trains about, so what my software does in his case, is monitor occupancy and take that into account when setting routes when requested by the dual button actuations. Since my layout is also actually run by the software, I am able to display the timetable names of the trains that occupy tracks etc. in the style used in Germany by the Sp Dr L 60. A name in red indicates that the train is present and when in white it indicates that the tracks are reserved for that train, which is yet to arrive. 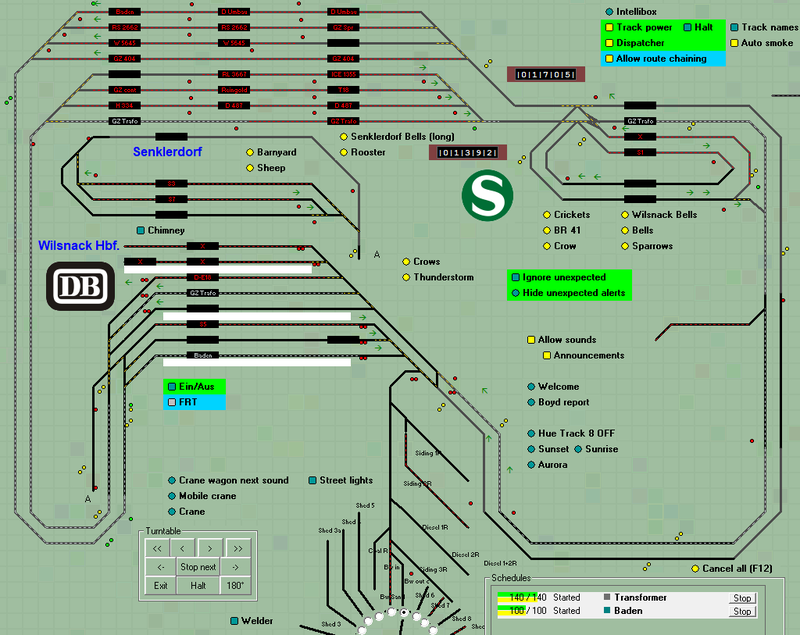 In the example below, the train with timetable name "Baden" has been set on a route from the hidden station up to Wilsnack Hbf. where it will arrive at Platform 5 - and its name is shown in white there. Another train, with timetable name "GZ Trafo" is running out of the hidden station track 8 and will travel all around the layout and arrive in track 8 again. When "GZ Trafo" passes the brown axle counter, the exact number of axles in the train will be added to the counter!